TOLLAND - The town of Berlin is known for a few things, but one in particular is its football team. Year after year the Redcoats have produced a number of skilled players: Boy Mayyette, Edward Hrubiec, Adam Salinia, Max DeLorenzo, the list goes on and on. This season, Berlin has a number of key playmakers it can rely on, including quarterback Kevin Dunn, wide receiver Giancarlo Tufano and running backs Alex Halkias, Zach Hrubiec and Larry St. Pierre. New to the group is sophomore Marco Scarano. Last year, as a freshman, Scarano had his breakout game in Berlin’s regular season finale against New Britain. With five players out due to injuries, Scarano was forced to step up. He totaled 69 total yards in the game. The “young gun,” as St. Pierre refers to him as, only sees Scarano getting better, especially with the varsity experience Scarano gets to learn from. Scarano certainly seems to be taking the lesson well. Through seven games this season Scarano has rushed for 257 yards and four touchdowns. 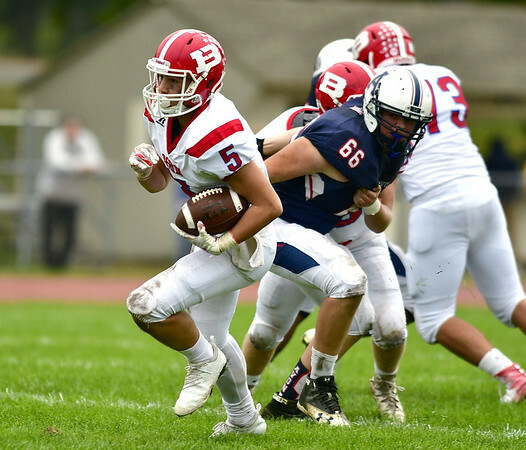 In the Redcoats’ 45-11 win over Tolland on Friday, the sophomore had four carries for 127 yards and two touchdowns, both over 40 yards. One was a 43-yard dash, while the other went for 80 yards. His speed and agility allowed him to get to the end zone completely untouched both times. Scarano, however, took the success in stride. Before Scarano started playing football in third grade, he played soccer with his older brother, Dominic, who is a senior on the Redcoats’ football team. Aside from his speed, Scarano has another talent that he hasn’t had the opportunity to show this season. According to his father, Scarano is an unbelievable kicker. This year’s varsity kicker is Tufano who is 33-for-36 on extra points with two field goals. But after this season, the kicker position will be vacant. What Scarano’s role will in the future is still to be determined, but he’s certainly going to be a player opposing teams will have to watch out for. Posted in New Britain Herald, Berlin on Monday, 29 October 2018 20:42. Updated: Monday, 29 October 2018 20:44.